There's typically a triradius found near the wrist on the palm, at the center, between the Thenar and Hypothenar or Venus and Lower Moon (or as I call Pluto). In the palm you've uploaded, this triradius is found much higher closer to the head line. From my experience, people with this horizontal like pattern to the ridges on the Moon area tend to have good memories. What I call linear memories. They can remember things in an orderly fashion. Good recall. Usually they have a high IQ or are naturally adept at things that involve organized minds and good memory. The highly placed triradius can sometimes be associated with various health issues when found in combination with other physical features or conditions. The ridges that typically flow in this area, flow down from the radial side of the palm and leave the palm on the ulnar side or loop back around. 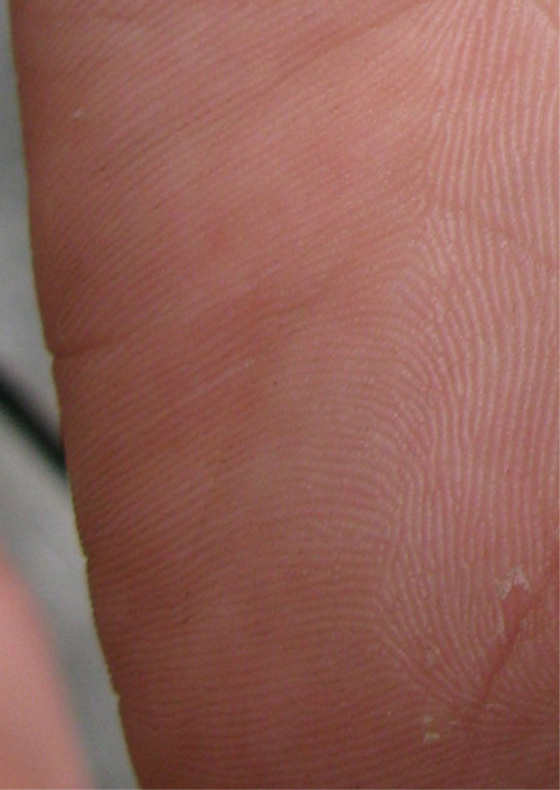 The ridges that form at the base of the palm on the hypothenar side are about the last ridges to form on the palm and usually the ridges directed from the radial side have dominated the territory. In this case the ridges rising from above the wrist cover an area much larger than normal. Not much, if anything, has been written about this formation in regards to readings, but I have a few theories. I think the single looping is a result of ridges forming laterally from the ulnar edge are meeting with a field of ridges rising from the wrist. I just recalled the term "line of demarcation" used for the appearance of a separation between the fields down the palm in this area. I don't recall which palmistry book was the source. Looking closer, there might be two triadii. See red lines. Very interesting and unusual flow of ridges! Like a river of ridges flowing between two fields. The appearance of a line of separation is common enough. Two triradii relate to a whorl. The pattern can be continued in the skin on the back of the hand, although you won't be able to see it as it's no longer ridged skin. Hair on the back of the hand may continue the flow of the pattern. kiwihands wrote: Thank you Patti! That was really helpful. I'll keep an eye out for "line of demarcation", great to know what it's called. And yes, I was thinking that, too - two triadii. How fascinating! Also what you say about the pattern possibly being continued in the skin on the back of the hand, I'll have to have a peek at the hair there. Would expect the hair to form a whorl of sorts? I can confirm that my friend with this pattern has a very high IQ and is quite an unusual human (as far as I can judge)! I'm not sure about his memory, but he is one of those lucky people who never had to study in school, so probably yes. Sorry, when you say "Not much, if anything, has been written about this formation in regards to readings, but I have a few theories" - did you mean you have more theories, or were you referring to what you said about memory, etc.? Again, your explanation with regards to the development of the ridges is very interesting. To me, this pattern did look like the ridges emanating from the radial side staked out their ground first, and the rest had to fit in around them. But I didn't know that there was an order to ridge development in the palm. Thanks for sharing your knowledge! 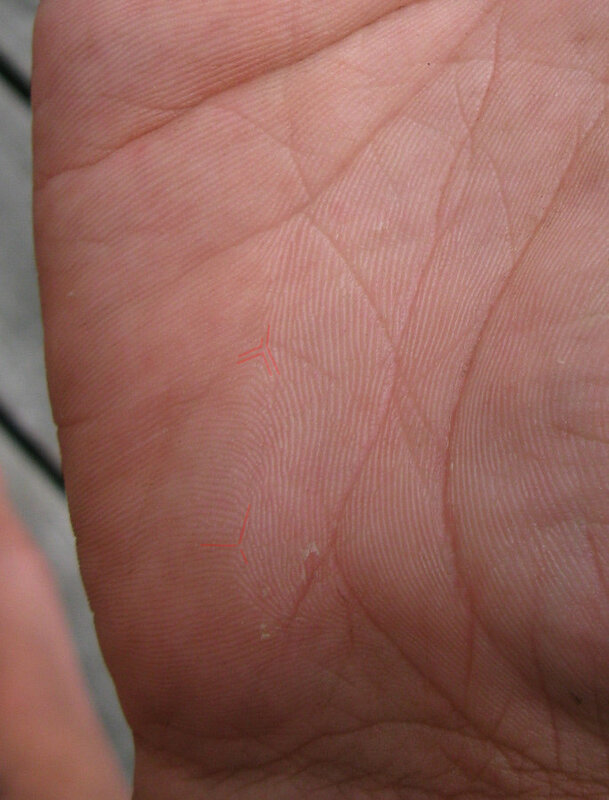 Ridges on the palm primarily start on the radial side and spread across. 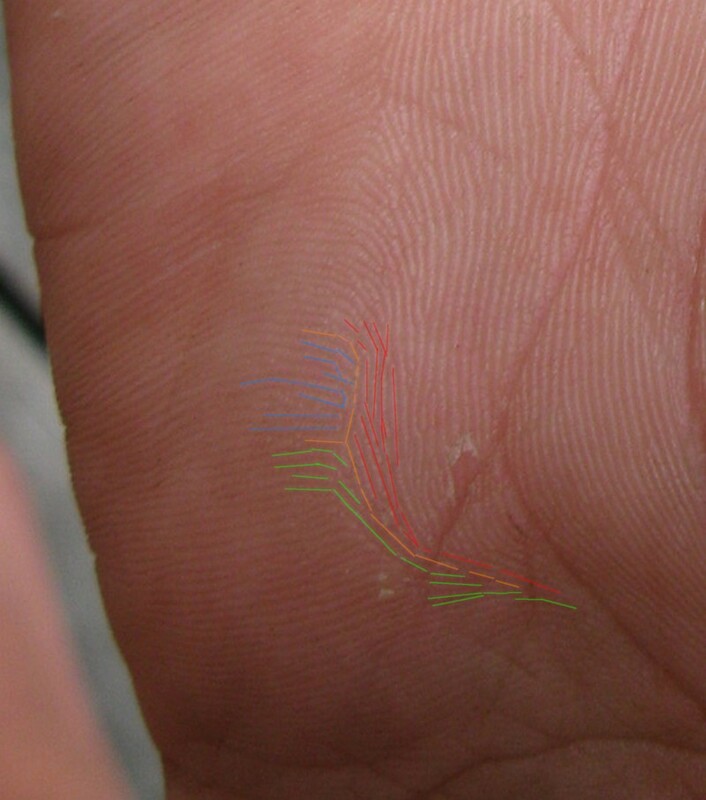 In this palm you can definitely see the lateral nature of the ridges from the percussion meeting both the ridges from the radial side and from the lower thenar area. 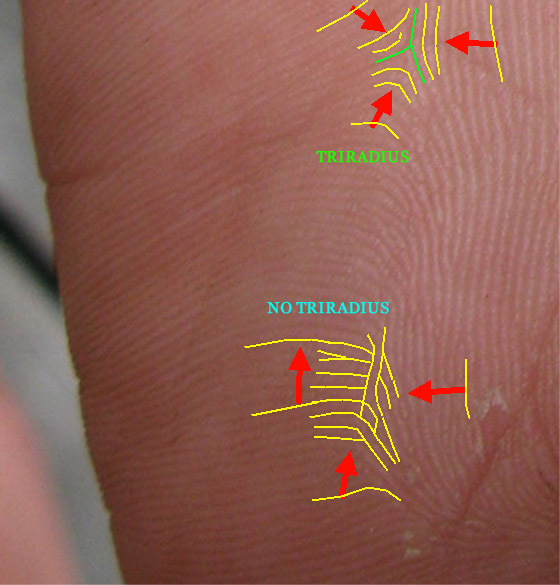 The ridges flowing upward and toward the percussion from the wrist area, thenar side, flow *between* these two triradii! That's unusual! The reason this lower hypothenar is typically the last area to form ridges is that it is one of the last areas to finish developing or fleshing out - so while ridges are forming on one part of the palm, this area isn't ready to develop ridges just yet. 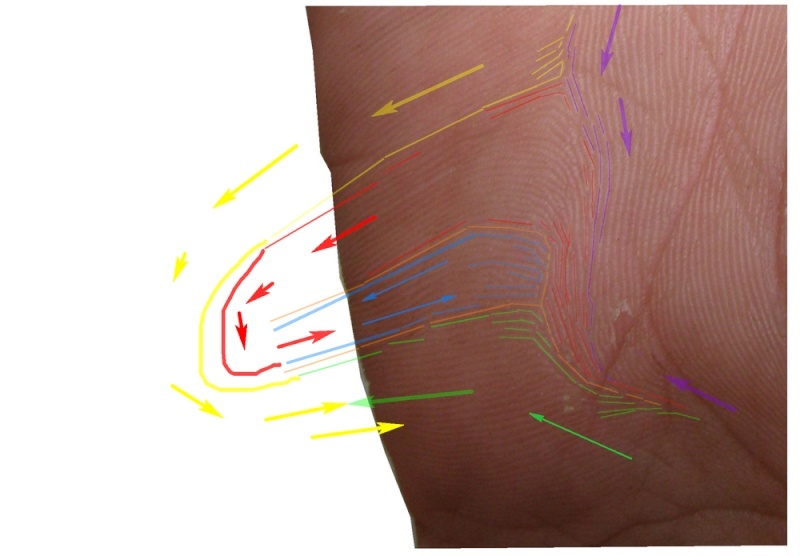 Since it is typical for this lower thenar to develop last....and people with this unique pattern tend to be pretty gifted when it comes to brains, I'd say it's an enhancement rather than a deformity or related to delayed development. Instead I'd think of it as advanced development. If you trace the ridges, I think you'll find that all the ridges above the higher up triradius can be traced back to the ulnar side the index finger's triradius. The ridges between the two triradii are rising from the lower thenar area. Like an "inspiration loop" but there is no visible loop. If I'm correct with the ridges leading back to the index finger, then that would mean all the ridges from the radial side wrap around the thumb. When I typically see the ridges flow from the radial side and then curve and sweep down to the wrist under the thumb, there are no ridges coming in laterally from the percussion side at all. Would love to hear more about this person. What kind of work do they do? Thank you Kiwi!! back to ya! I think his having a degree in digital animation is a perfect example of what I call linear and organized thinking. To create an animation, he'd have to have a sequence of images in his head to create the animated effect before digitalizing it. kiwihands wrote: ... while I'm at it, here is another high axial triradius (a friend of mine). The skin ridge formations in this whole area strike me as very odd, with lots of ending ridges and single loops coming from the percussion, and being stopped by, or forming angles with rising ridges. Not sure what to think of this and would really appreciate your input - maybe it's actually quite common and I'm just showing my lack of experience again? 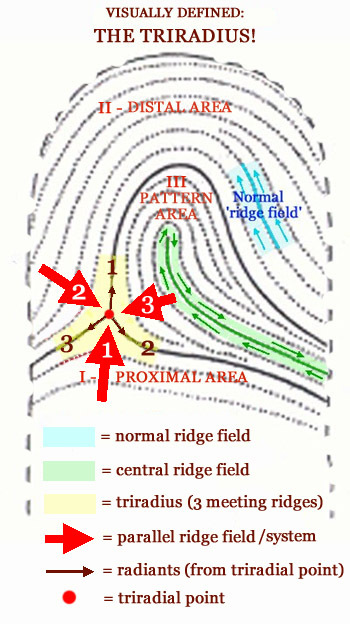 After taking a look at the how the individual ridges develop below the 'high positioned triradius', I observe that none of the other ridges one can speak of a 'confluence of three parallel ridge systems' as defined by the red arrows in the picture at the bottom of this post. 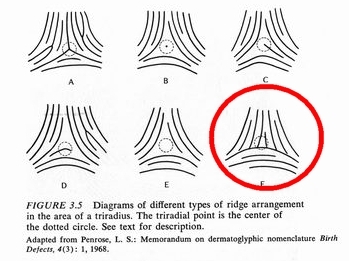 Kiwihands, for the example that you presented this implicates that the dermatoglyphics in this palmar zone can only be described as a 'high positioned triradius' - SPECIFIED: featured with various irregular ridge formations (which appear to manifest as fusing ridges). But I would not describe there irregular ridge formations as unusualy, because they are not rare to be observed on the hypothenar zone (mount of moon) & the thenar (mount of venus). The lower triradius resembles F above. 2 fields merging laterally, and 1 field horizontal. In my opinion there are 2 hypothenar triradii. It is interesting to study your friend's hand. I mentioned that I think the pattern in the hypothenar is potentially an inspiration loop. Kind of like in the image below, except the loop part is extralimital. In your friend's hand the lower 'triradius' alters the pattern and flow of ridges differently than we see in this print. Notice in this print the single ridge looping effect above the triradius that is also similar. The area in blue could be a form of a nature loop. A loop with many 'rods' rather than recurving ridges. The mix of an inspiration loop and a nature loop - would actually be a double loop of some sort. Martijn, is there a particular reason you traced the grooves rather than the ridges? That may be the reason you were unable to distinguish the 2nd triradius. Hi Patti, you're right about that I should have followed the ridges - instead of the grooves. - there is no 'confluence of three parallel ridge fields'. And if you recognize how the light blue dots and the purple dots are ridges that appear to be 'interrupted' by irregular small pieces of ridges... then one can 'understand' why there is no 'loop', nor a 'triadius'. I am not denying that there appear to be 3 ridges that make a likewise connection as seen in a true 'triradius' - however, the surrounding ridges + the various irregularities indicate that these 3 ridges do not make a true triradius (and the missing of a loop VALIDATES this conclusion). That's okay Martijn if you reject my 'possibility'. 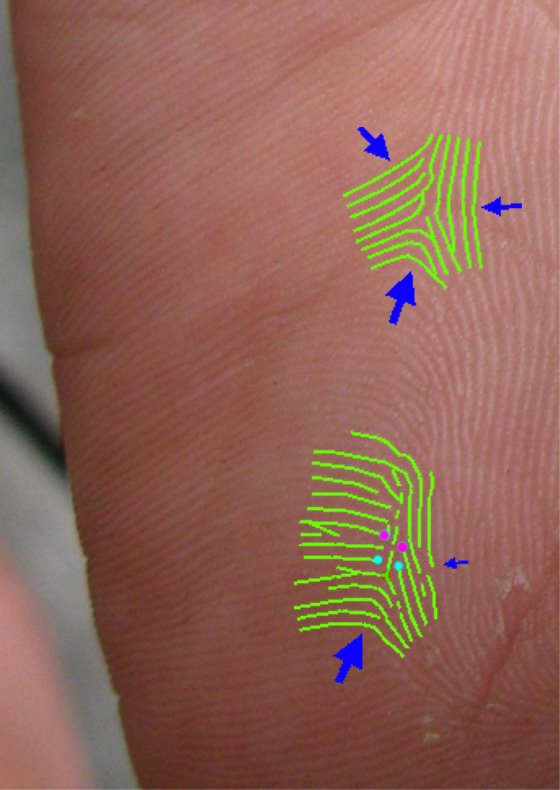 The rule 'two triradii relate to a whorl' is only true for the fingerprints. Instead: 'hypothenar whorls' require the presence of 3 triradii - because the hypothenar usually has one hypothenar triradius which related to the presence of the thumb; and therefore in a 'hypothenar loop' usually are 2 hypothenar triradii seen, and in a 'hypothenar whorl' typically 3 hypothenar triradii are seen. PS. But one should also always be aware of the possible effects of the presence of 'extralimital triradii' - but again, the VISIBLE RIDGES should provide a clue before one jumps into such 'theorectical considerations'. Yes, you are correct, there is likely a triradius outside the double loop I drew - just like in my own palms - except the triradius is visible at the very edge in my palms. The radiants from that triradius outline the 'greater pattern' beyond the much smaller double loop whorl inside. Sorry I couldn’t reply any sooner! I had quick peeks to see your replies but couldn’t find any proper computer time this weekend. Following Martijn’s definition of a triradius (confluence of 3 fields), I’m now not so sure any more if what looks like a triradius really IS a triradius... Haha, this is complicated! You mentioned the possibility of an “extralimital” loop – this is fascinating! I had not come across that concept before, could you recommend a book or an author where I could read up on that? My friend having a form of a nature loop (loop with many 'rods' rather than recurving ridges, like you said) would fit very well with his character – he despises cities and has no problem hiking in the bush for a week, sleeping under the stars and catching his own food if need be. He also has an odd affinity with animals and is the only person my (very neurotic and fearful) cat allowed to approach straight from the start. About the possibility of an inspiration loop I’m not sure – there is definitely awareness and interest in the deeper things of life, but maybe not more than “average”. Ps: This just gave me a little flashback to the time I was writing my master’s thesis: I had two supervisors whose approaches couldn’t have been any more different – they really clashed on every single level. After seeing each of them in turn I remember always changing my mind about whom to follow mentally, but in the end I was so torn I had to choose my own, alternative approach. This was the best thing that could have happened, but impossible without their difference in opinion. Thanks Kiwi. I understand it may be confusing. As you may have noticed, Lynn and I are not completely in agreement with Martijns New Definition of a triradius. The intense discussions always advance my understanding and knowledge. I apologise for the long time it took me to respond, had a very busy weekend. Thank you very much for your very detailed analysis and great explanation. Your definition of the triradius on the other page was very helpful indeed – I don’t own any of the books you mentioned, so while trying to follow the other discussion I was getting a little bit confused with the terminology and how it all fit together. It all makes much more sense now! But your red arrows do make it very easy to see the lack of a 'confluence of three parallel ridge systems', so if this is an essential aspect of a triradius, then of course my friend’s formation doesn’t count. Also very interesting to hear that these kinds of irregular ridge formations aren’t that unusual at all! This is, again, where experience comes in... I’m so happy to have found this forum and be able to get guidance and inspiration from the veterans. I find particularly that learning to judge whether or not a feature I see is “normal” or “noteworthy” is one of my biggest challenges at this stage! It really is invaluable to have your forum for this purpose. Okay Kiwihands, thanks for your feedback. Great to hear that the 'lack of a confluence of 3 parallel ridge systems made sense to you. 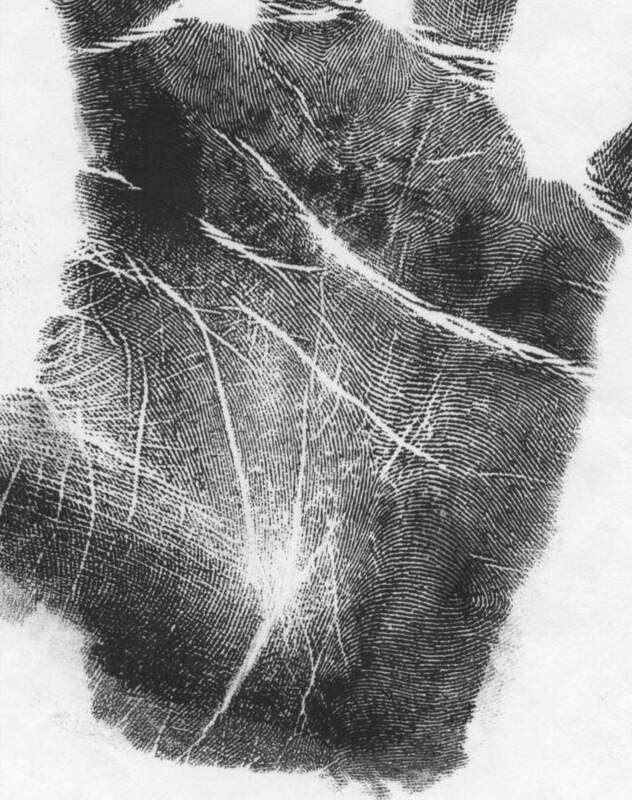 And I also noticed how you tried to apply that aspect of my definition to a fingerprint in the other discussion (that wasn't a bad attempt at all, however especially in a fingerprint one should solely focuss on the 2 or 3 ridges surrounding the 'triradial point').